Doménico Chiappe, a Peruvian-Venezuelan writer and a journalist currently living in Madrid, has written and produced two delightful works of electronic literature: Tierra de extracción (1996-2007) and Hotel Minotauro (2013-2014). His works depict a critical and pleasant voyage to diverse Latin-American landscapes where poetry within prose, and prose within poetry, submerge the reader into hypermedial embedded narratives. 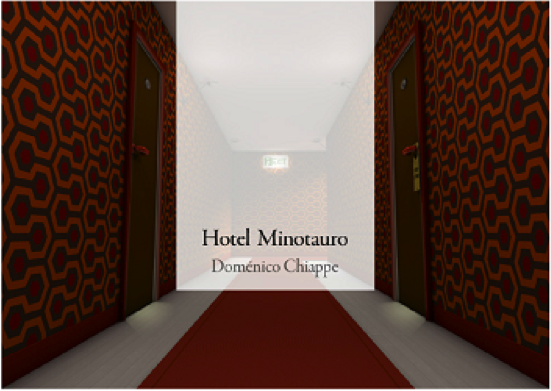 Hotel Minotauro (basta con abrir las puertas de un hotel) is a hypermedial novel based on a real crime investigation. By opening one door after another while listening to the captivating background music, the reader is challenged to grasp the meaning of his own wandering throughout the hotel. Step by step, and click by click, the reader becomes a detective that collects evidence by hovering the mouse each time he wishes to know what lies behind every mysterious door. Music seems to be a leitmotif in Chiappe’s hypermedial novels and plays a significant role because it not only hides and hosts new stories but also enhances and elaborates the plot of the one being experienced. The novel is inspired on the Greek Myth of the Minotaur. The Mythological characters are camouflaged in the halls of the hypermedial hotel evoking the labyrinth in which the Minotaur was once lost. Though this time, as presented by the narrative voice, the nodes are the elements that artistically weave and deconstruct the hotel’s forked paths. The work was originally written in Spanish; but the English version is also available and waiting to be explored by curious readers. Melodies of hyperphony echoing in the rooms, lines of cocaine outlining kinetic drawings, a labyrinth that expands and shortens memory, the ghosts of Daedalus, Pasiphae, the King of Minos wandering in the halls, misty rooms that hide unbearable realities tinged by politics and corruption, a sickle that slashes the screen in order to construct meaning, the shadow of an award-winning writer– these are the components that skillfully inhabit the abstract literary geometry of Chiappe’s electronic oeuvre. Don’t miss the opportunity to spend at least one night at the Hotel Minotauro.